» What is a stinger? Stingers or burners are common injuries among collision athletes, but most of these injuries are not long-lasting or serious in nature. A stinger, more formally known as brachial neuropraxia, results when there is injury to the vast network of nerves surrounding the neck and traveling to the shoulder, arm, and hand. These nerves are susceptible to injury when the head is forcibly pushed into an extreme range of motion.Stingers can also occur after a direct blow to the area between the neck and shoulder. 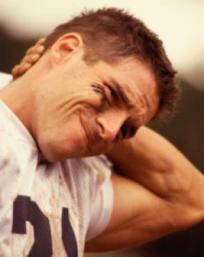 This injury commonly occurs in football, wrestling, rugby, and gymnastics. Symptoms include neck pain, numbness, burning, and weakness in one arm. Symptoms in both arms could be indicative of a more serious spine injury and should be evaluated by medical personnel immediately. The symptoms of a stinger usually subside in moments to hours but more serious injuries can last for weeks. Injuries with symptoms that persist should be referred to an orthopaedic surgeon for further evaluation. Permanent injury is rare but can occur. When can an athlete return to his/her sport? Athletes can return to their sport as soon as they can perform full range of motion of the neck and shoulder without symptoms. Additionally, they should demonstrate full strength and normal sensation in the upper extremities. Athletes who return to sport with residual numbness or weakness are at increased risk for further injury. Most athletes who sustain stingers can expect to recover and return to their sport within minutes or hours. In rare cases, stingers can become recurrent or chronic. This is commonly the result of accompanying injuries in the spine such as a herniated disk or a narrowed cervical nerve opening. These abnormalities can cause an athlete to be at increased risk for stingers or to experience prolonged symptoms after injury. How can I prevent this injury from happening again? Athletes who experience prolonged symptoms should be evaluated by an orthopaedic surgeon and should work with a certified athletic trainer or a physical therapist to improve neck strength and flexibility to minimize the risk of future injury. Equipment should be assessed to ensure proper fitting. Some additional equipment, such as football cowboy collars and neck rolls designed to limit the range of motion of the neck, may also be helpful to help reduce the risk of re-injury..